I feel like I'm breaking some kind of food blogger rule posting this recipe in November, because aren't we suppose to only do Holiday foods laden with pumpkin, and turkey? But what the heck! When your first born turns 6 and decides that he wants a random food that looks like other food cupcake for his birthday, you jump at the chance to pull out all the stops...Kinda. I thought that he would want the standard pokemon cupcake, with which I could head out to the local party store, pick up a few themed cupcake toppers and call it a day. Nooope, not my kid. He wanted hamburger cupcakes. Sounds easy enough, it was basically a vanilla cupcake with a brownie in the middle. But... then I realized that I had to make 28+ cupcakes for his class, and that simple project seemed more daunting that I realized. So, I scoured the web for another idea and came upon this gem. Cupcakes that looked like boxes of popcorn, using marshmallows! Genius! I stealthily convinced my boy that this was a much better way to go and Buttered Popcorn Cupcakes were born! But being the crazy person that I am, I am not satisfied with buying box mix and throwing a couple of marshmallows on top and calling it a day. No, sir. Why make it easy when I can make it way harder on myself!? I ordered the specific red and white striped cupcake liners (how else can you really tell it was a popcorn box!? ), bought the yellow spray food coloring (for a more natural "butter" effect, of course) And decide to make the frosting actually taste like buttered popcorn...without it being totally disgusting of course! I started with my favorite chocolate cake recipe from the woks of life. I reduced the sugar and turned them into cupcakes. Then onto the frosting. I used buttercream as my base, because it had to taste like butter...duh. Then I took some dehydrated corn kernels (don't worry, you can get this on Amazon. ), threw them into a food processor and make it into a powder. 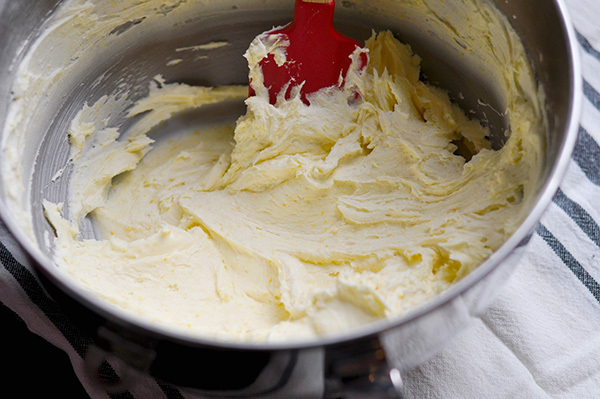 This made the buttercream have that light corn flavor. A added abut 2 pinches of salt to balance out the sweetness and to give it that essential popcorn flavor. It totally worked. It tasted sweet, but salty and deliciously buttery. I topped the chocolate cupcakes with this buttery concoction, and then it was time for the real labor. Snipping a large bag of mini marshmallows to look like popcorn kernels! Snipe the top of a mini marshmallow twice in across the top, so it resembles a cross, then with your fingers pushed the tops down to smoosh the marshmallow a bit and push out the snipped sides to make it really resemble a popcorn kernel. Place these all over the top of your frosted cupcake and spray lightly with the yellow spray food coloring and they turn into perfectly poppable buttered popcorn cupcakes! One tip when topping with the marshmallows, make sure you do it right after frosting your cupcake, if you wait too long, the frosting dries and makes it harder to stick the marshmallows on! add powdered sugar, one cup at a time. Mix on low till the sugar is just combined, then bring it up to a medium speed till it's smooth. Add in the powdered corn kernels and pinches of salt. Mix to combine. Add more salt to taste. Take a mini marshmallow and cut two slits across the top using kitchen shears. One horizontally and one vertically so it looks like a plus sign. With your finger, push down the top of the marshmallow where the slits were cut, essentially pushing out the four quadrants of the top of the marshmallow. This will make it more fully resemble a popped corn kernel. Place on the frosted cupcake before the frosting sets. Voila, a couple dozen more of these and you got yourself a mini marshmallow popcorn box!